I dated Giuseppe for nine months. He was an Italian man from a wealthy Southern family, literary translator, finishing a PhD on Proust at the University of Florence, and living half his life in Paris. His schedule was that of an independent intellectual – getting to sleep at two, three, four AM, waking up at noon, and often working in bed. He shared an apartment with a rotating group of Italian expats in the fifth district of Paris, next to the Jardin des Plantes – but would often stay with me for days at a time in my little one-bedroom in Belleville. One morning, he asked me for a cushion to support his back while he worked on his thesis in bed. The Tati store outside metro Barbès is a Paris landmark for bargain clothes, meringue-style wedding gowns and plastic slippers. Four times a week, I passed it on my way to the Sorbonne centre for Arts and Humanities at Porte de Clignancourt, where I taught undergraduate linguistics and English grammar classes. I normally rushed down metal stairs from line 2 (overground) to line 4 (underground), catching a glimpse of the Tati store through metal bars on the way, but sometimes, I would get out for a walk around the Barbès area. I bought the sheep-teddy-cushion at Tati for three euros. It’s rectangular in shape, about the size of an A4 sheet, covered in curly white acrylic mock wool, with four dangling legs, a felt sheep head with plastic black eyes, black thread embroidery marking the nose and mouth, and a small rectangular tail covered in the same acrylic wool. The fabric is shiny, casting silvery reflections, as if each curl was coated in plastic. A rounded piece of thick rope is sewn into the neck, probably to carry the cushion around, or hang it somewhere, as I now have. When I brought the teddy-sheep home, Giuseppe exclaimed ‘it’s fantastic’, as if this was precisely the cushion he’d been picturing in his mind. I was not surprised. Our relationship was largely literary, and this sheep had its own literary echoes in my mind. It was the sheep thrown overboard by a revengeful Panurge in a famous scene by Rabelais, leading an idiotic herd of blind followers to their death, and it was La Fontaine’s poor Robin Mouton, whose unavenged death exposes the cowardice of his wooly companions, dispersing when they see but the shadow of a wolf. 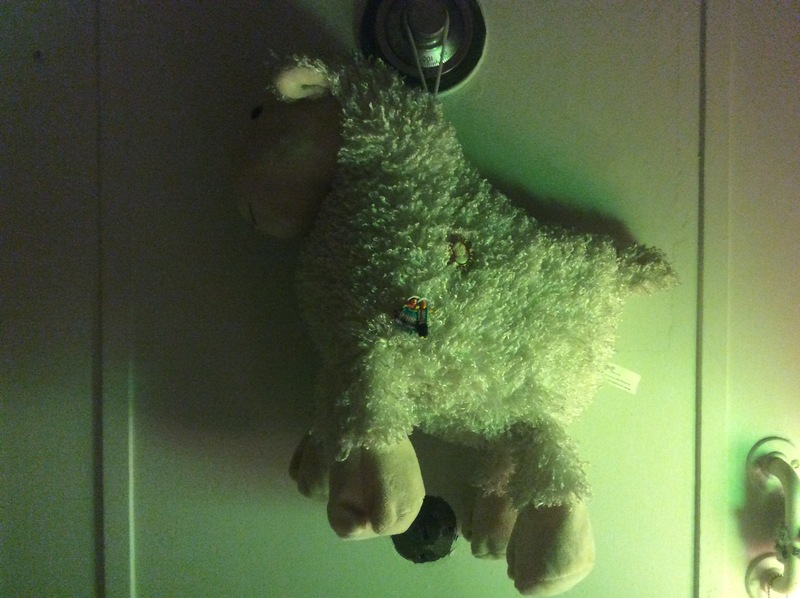 The sheep is now hanging over my head, behind the white futon where I do most of my work at home. A soft decorative memory from my Parisian past, and a gentle reminder of my literary ambitions.